See more objects with the color darkolivegreen darkolivegreen grey lightgrey tan or see all the colors for this object. This is a Sidewall. It was designed by Dorothy Draper and made by Dorothy Draper & Co., Inc.. It is dated 1973 and we acquired it in 1979. Its medium is screen printed on paper. It is a part of the Wallcoverings department. Dorothy Draper is one of the most-loved decorators of the 20th century. She stressed that the most important aspect of decorating was having courage and her 1939 book, Decorating Is Fun, inspired many housewives. Her style was bold. Draper used vibrant colors in innovative combinations together with elaborate moldings and strong pieces of furniture. 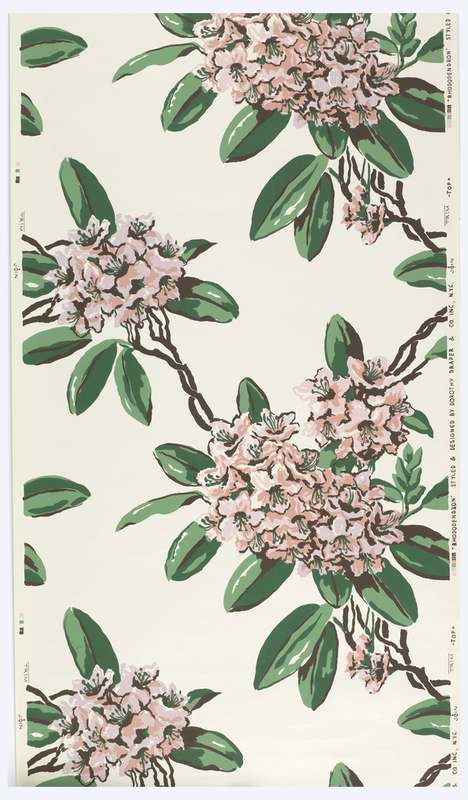 Rhododendron was designed for the renovation of the Greenbrier Hotel in White Sulphur Springs, West Virginia in 1948, requiring fifteen thousand rolls of to line the halls. This object was featured in our Object of the Day series in a post titled Dorothy Draper's Rhododendron. This object was donated by The Greenbrier Hotel. It is credited Gift of The Greenbrier Hotel.